It’s that time of day again. 06.24. Precisely. Went to bed at 9 o’clock so no wonder really. I wasn’t the first to go. Sue and dad went and then Tom. I was knackered after cooking the lunch. Fortunately there as help at hand to clear up afterwards. The beef was a big success as were the parsnips in parmesan and the honey glazed carrots. Only niggles were the fact that I over did the yorkshires and totally forgot to cook any peas. Trivia. We had a great Christmas Day overall. Tom invented a new board game called Chinese Exchequers that proved to be great fun. Joe, John and Hannah entertained us with Christmas carols on the joanna, sax and flute. The TV was brilliant – Morecambe and Wise Christmas Special 1976, Blackadder Christmas Special and the Dad’s Army where they accidentally shot a turkey. All repeats but all totally watchable. Santa was good to us all so we must have been good during the year. Now the space around the base of the tree is bare again. Today I’ll be wearing my new FatFace campervan socks. I’m picking dad and Sue up at 9.30 this morning. A little later than yesterday. We are unlikely to do a big breakfast as we did yesterday. For one I am still feeling full and we finished lunch at 4pm yesterday. I expect I’ll manage a bacon and mushroom sandwich (on white with HP obvs) and a glass of milk, with perhaps some fresh orange and a little grapefruit:) Oh and tea of course. It will be Sarah’s last day with us. She asks about when she is going home around once every half an hour. Sarah has down’s syndrome and lives at a hostel on the Wirral. The hostel is great and she loves living there which is good. She has easily slotted into the team at Wragby Road whilst she’s been with us. I can hear cars on the road outside. There were none yesterday when I went to pick up dad and Sue. A couple of female runners out in their brightly coloured lycra. Makes a lorra sense to me. The news on the wire this morning is that George Michael died yesterday, or last night. A lot of famous people seemed to have gone in 2016. He was only 53. I am 55. Brings things into perspective. I like the number 55. It’s a nice round number. Only 5 more diary entries after this one. I’ve got into the routine of doing it now. Don’t know whether I’ll continue into the new year. The kindling has been sourced and the fire lit again. Really roaring in the grate. 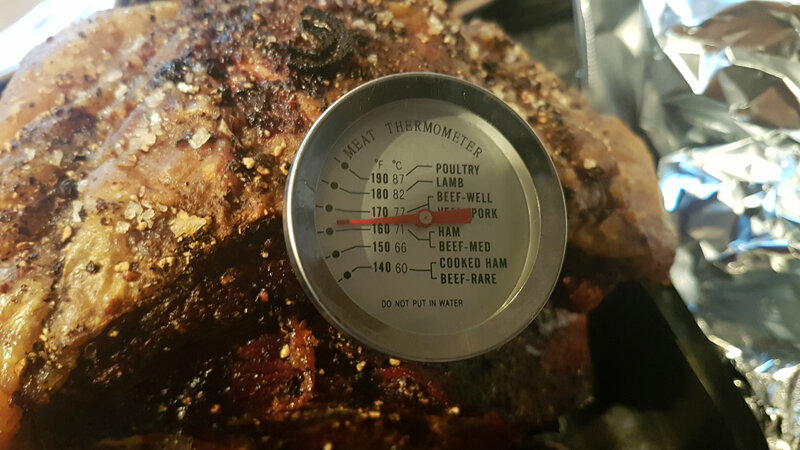 Means it will have warmed up by the time I go and pick up dad and Sue. I’ve not had to use matches for a few days. Only burning wood too so the ashes will go well on the raspberry patch. Also written Tom’s birthday card. A double celebration over Christmas and Boxing Day. He’s had some sort of posh light bulb for use when he does his vids. Sarah is up and awaiting beans on toast. Someone is in the shower, we know not who. There will have to be a trip to Tesco this morning. We need eggs for a birthday cake and we will need more bread. No doubt something else too. 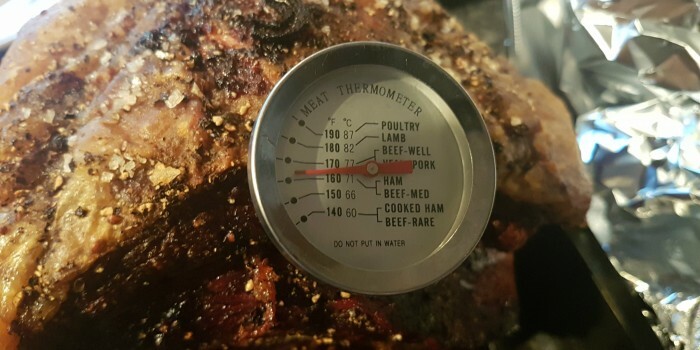 Featured image is the meat thermometer in the beef – slightly more medium than perfection demands but the meat turned out well. Posted on December 26th, by Trefor Davies in chinks.